Polyoxometalates (POMs) are metal oxo clusters that have been investigated for several applications in material sciences, catalysis, and biomedicine; these gained increasing interest in the field of nanotechnology as nanocarriers for drug delivery. Associated to the increasing applications, there is the need for information regarding the effects on the environment of these compounds, which is completely absent in the literature. In the present study, the effects of europium polyoxometalates encapsulated into silica nanoparticles (Eu-POM/SiO2 NPs) were assessed on the soil representative Enchytraeus crypticus. The individual materials were also assessed (Eu-POMs and SiO2 NPs). Toxicity was evaluated in various test media with increasing complexity: water, soil/water extracts, and soil. Toxicity was only observed for Eu-POM/SiO2 NPs and in the presence of soil components. Despite the fact that effects were observed for concentrations higher than current predicted environmental concentration (PEC), attention should be given to the growing use of these compounds. The present study shows the importance of assessing the effects in soil media, also compared to water. Moreover, results of “no effect” are critically needed and often unpublished. 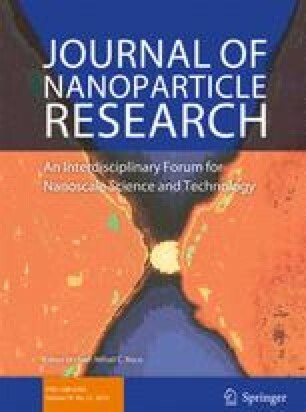 The present study can contribute to the improvement of the OECD guidelines for safety of manufactured nanomaterials on environmental toxicity in the soil compartment providing an improved test alternative. The online version of this article (doi: 10.1007/s11051-016-3662-0) contains supplementary material, which is available to authorized users. Thanks are due to the financial support of Center for Environmental and Marine Studies (CESAM) (UID/AMB/50017) and Aveiro Institute of Materials (CICECO) (FCT Ref. UID/CTM/50011/2013) project POCI-01-0145-FEDER-007679, financed by national funds through the Foundation for Science and Technology/Minister of Science, Technology and Higher Education (FCT/MEC) and when appropriate co-financed by the European Regional Development Fund (ERDF) under the PT2020 Partnership Agreement, and FCT by a PhD grant to Rita Bicho (SFRH/BD/102702/2014).